From its inception over 35 years ago, Punk has had a great influence on art and culture, from music to literature, visual arts to fashion. 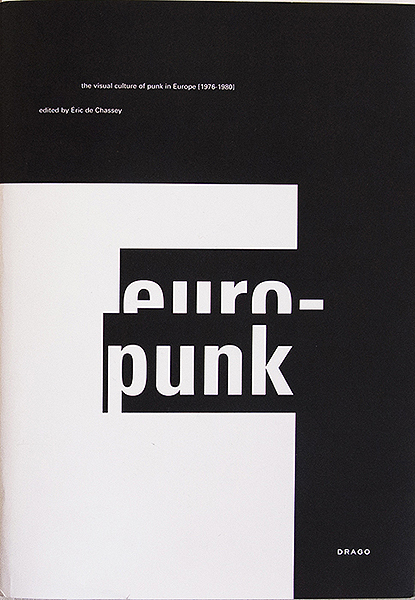 Europunk serves as the catalogue for the widely acclaimed exhibition of the same name, held in 2011 at Académie de France à Rome – Villa Medici in Rome, Italy and later at the Musée d’Art Moderne et Contemporain in Geneva, Switzerland. The book focuses on the visual culture of Punk in Europe in the second half of the 1970s. Rather than telling a well rehearsed history that follows the path of musical influences, Europunk begins with the simultaneous appearance of an alternative way of creating and using images in England and France around 1975-76, in the hands of graphic designers, illustrators, image makers and agitators such as Jamie Reid, Malcolm McLaren or Bazooka (a team consisting of Olivia Clavel, Kiki Picasso, Loulou Picasso, Ti-5 Dur and Bernard Vidal). It proceeds with the images and methods that began to spread all over Europe, before the advent of New-Wave and the transfer into high-culture, with emphasis on local scenes as lively as Amsterdam, Berlin, Brussels, Düsseldorf, Geneva, London, Manchester, Milano, Paris, Pordenone, Zürich. Europunk gathers a vast array of visual material, some of it well known, some under-recognized: fanzines, posters, clothes, paintings, objects, record covers, flyers, films… By stressing the incredible quality and vitality of these alternative artistic productions, the book shows how the visual subculture of Punk embodied both a desire for a “tabula rasa” and a cultural renewal that were synonymous with a new energy and a principle of maximized creative freedom that has had deep political bearings and far-reaching artistic and sociological effects. Edited by Eric de Chassey, director of the French Academy in Rome, Villa Medici and Fabrice Stroun, Director of the Museum of Modern and Contemporary Art of Geneva, the book Includes contributions on the origins of the movement in the music scene by Jon Savage – author of England’s Dreaming, and Jerry Goossens – Dutch journalist.